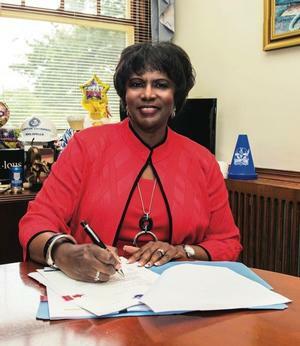 HAMPTON, Va. (August 15, 2018) — Hampton University’s Vice President for Business Affairs and Treasurer, Mrs. Doretha J. Spells, was recently featured in the August/September edition of CoVaBiz Magazine – The Business Magazine of Coastal Virginia. Being very active in her church, Mrs. Spells is also a member of the Denbigh Chapter of Delta Sigma Theta Sorority, Inc. She serves as Chair of the Trustee Board and Vice President of the Deaconess Ministry at her church, New Beech Grove Baptist Church in Newport News, VA; and also sits on the board of the Virginia Educators Credit Union (VECU); and the Peninsula Pastoral Counseling Center. Mrs. Spells also participates in her church bowling league. She has a Business Administration bachelor’s degree from South Carolina State University and a Master of Business Administration degree from Tennessee Technological University.